Electrolux has re-entered the consumer robotic vacuum cleaning (RVC) market with two modells of the new MotionSense VC robot priced in Sweden SEK 4.495 resp. SEK 4.995 (including remote controll and virtual wall). The tiangular shaped robot has one side brush and a 210mm wide brush in front. Sound level 75dB, 60 minutes battery time and 3 hours to charge for the 2500mAh Li-ion battery according to productspec. Technologically the robot is low-tech using IR for edge cleaning and randome-style navigation. November 10 iRobot presented recently some interesting details about its new business strategy. The company is now solely focused on home maintaining and extending leadership in growing robotic vacuum cleaning (RVC), building wet floor care into second revenue stream, connecting iRobot products within the home, extending connected products and emerging as a strategic player in the Smart Home. iRobot's share of the global robot floor cleaning market is estimated to 60+% of units. The new product category Wet Floor Cleaning Robots (WFCR) could be larger than RVC in Asia, the company expects and the company will take direct control of the brand in China. iRobots future vision is now strongly based on the IOT & Smart Home concept with robots working together to deliver unique benefits. With cloud technology from Amazon to enable scale, robot control apps and cost effective breakthrough NAV performance iRobot will be recognized as an Emerging Player in IoT/Smart Home Market. How does Starship robotic delivery work? Former Skype co-founders have today announced the launch of a new company, Starship Technologies, which aims to fundamentally improve local delivery of goods and groceries, making it almost free. Starship Technologies will introduce fleets of small, safe, practical, free from CO2 emissions, and best of all, earthbound, delivery robots, which will create unprecedented convenience and cost savings for individuals, while opening up new opportunities for businesses such as parcel delivery firms or grocery stores. “Our vision revolves around three zeroes – zero cost, zero waiting time and zero environmental impact. We want to do to local deliveries what Skype did to telecommunications.” said Ahti Heinla, a Skype co-founder and CEO at Starship Technologies. 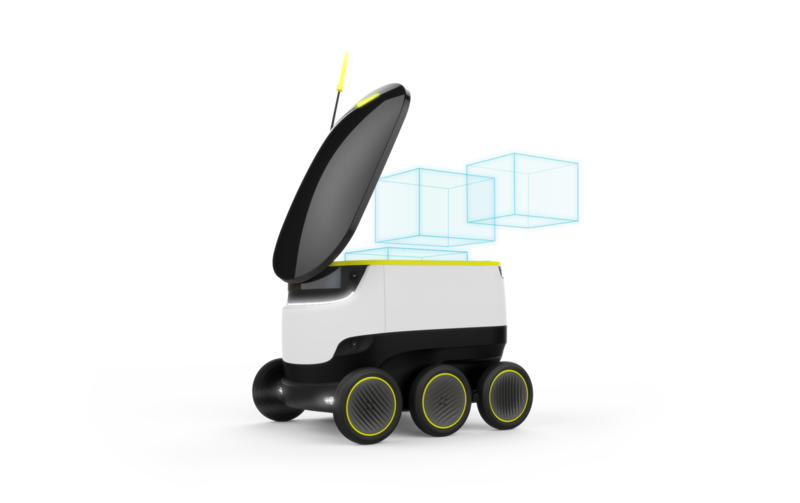 Starship robots are revolutionary devices that can carry parcels or grocery bags within a 3 mile (5km) radius. Starship’s technology and approach allows us to lower the cost of local delivery by a factor of 5-10x. Parcels and groceries are stored in Starship’s hubs and delivered when the clients request a delivery via the mobile app. It takes 5-30 minutes for the shipment to arrive, and the journey of the robot can be monitored on the shoppers smartphone device. Infonaut AB has got knowledge about a software named "Infonaut" promoted by US site www.infonautapp.com as an "ad -supported software". The software is classified as a so-called Potentially Unwanted Programs ( PUB ) because it installs cookies in browsers ( Google Chrome , Mozilla Firefox , Internet Explorer, Safari ) and starts monitoring users online activities. Infonaut AB hereby declares not to be involved in either development, marketing or distribution of this software. The European project Robot-Era is an ambitious integrated project. Its objective is to develop and implement the general feasibility, scientific/technical effectiveness and social/legal plausibility and acceptability by end-users of a plurality of complete advanced robotic services, integrated in intelligent environments, which will actively cooperate with older people to provide independent living. The project has set up a short survey to collect the point of view of secondary, tertiary and quaternary stakeholders on the introduction of robotic services in healthcare facilities. Link to the survey. This is the performance of the winner of the Amazon Picking Challenge 2015: Team RBO (https://www.robotics.tu-berlin.de/). Given an order of twelve objects, Team RBO correctly picked ten. Information in this weblog is of general nature and is not intended to address the specific circumstances of any particular individual or entity. Infonaut assumes no responsibility for the accessibility of links to external websites. Infonaut does not in any way endorse concepts, solutions, products and services offered by the institutes, organizations och companies named in this weblog. This weblog does not constitute professional or legal advice. Robotland is licensed under a Creative Commons Attribution-NonCommercial 3.0 Unported License.